Your long wait is over! Long-awaited by fans, this Robotech 1:100 scale GBP-1S Heavy Armor Veritech Transformable Action Figure is definitely a must-have! 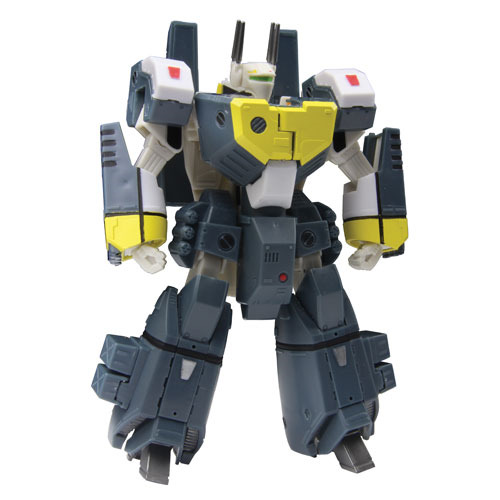 The Robotech 30th Anniversary Roy Fokker's GBP-1S Heavy Armor Veritech Transformable Action Figure (Yellow) stands approximately 6-inches tall, is fully articulated, and can be converted into Fighter, Battloid, or Gerwalk modes. Ages 14 and up. The Armored Veritech GBP-1 system allows a single VF-1 fighter to wield the artillery firepower of an entire squadron. The armor is able to withstand several withering barrages from enemy fire, but prevents the Veritech from transforming into fighter mode, and must be jettisoned if the pilot needs maneuverability. Please note, the heavy armor accessories can only be used in Battloid mode. Roy Fokker's GBP-1S Heavy Armor Veritech Transformable Action Figure (Yellow) comes with: left and right boosters, chest missile pack, shoulder missile packs, inner and outer arm cannons, left and right hip grenade packs, inner leg armor, outer leg missile pack, calf missile pack, and shin armor. Also included is a gunpod weapon accessory and an adjustable display stand, for maximum versatility and posability.